The BitScope Micro  measures, analyzes, and creates electrical signals. Once it is combined with suitable software on a computer, it can also function as an oscilloscope, logic analyzer, and signal generator. 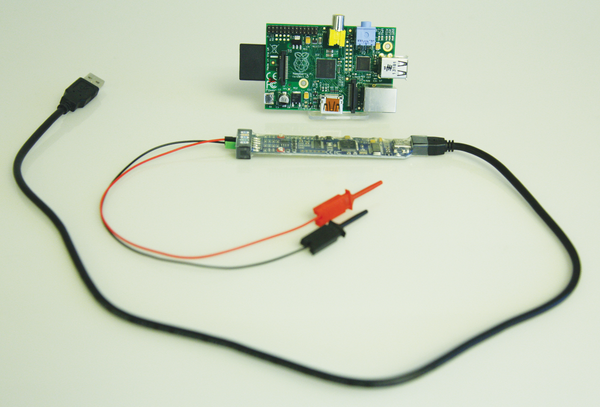 Because this type of software is available for a Raspberry Pi, the manufacturer of the BitScope Micro explicitly states in its advertisements that the unit can be used with the small-board computer. The diminutive size (~5 inches long and less than 1 inch wide/125x21mm) and moderate price ($145/£89/EUR109) help to support these claims. Given that the Pi is not exactly known for high performance, I was curious to find out whether the little computer could support the demands of the BitScope Micro. The price  for the BitScope Micro is significantly lower than competitor units that have been on the market for some time now. The Micro features six digital and two analog inputs that have a sampling rate of 20 megasamples per second (MSps) for analog acquisition and 40MSps for digital signals. The storage capability is just large enough to capture 12Ks (kilosamples) on a single channel. The numbers become correspondingly smaller when using multiple channels. The inputs handle up to 12V, and a signal generator is built into the unit. The BitScope comprises a single board about the size of a small candy bar (Figure 1) with a USB port at one end and a pin strip for connecting sensing elements at the other end (Figure 2). Ten small alligator clamps are included for use in connecting the sensing elements (Figure 3). If you are looking to use professional sensing contacts, you need an adapter for the pins and pin board, which you can purchase directly from BitScope  or build yourself. Figure 1: BitScope Micro top view. Figure 2: BitScope Micro reverse view. Figure 3: The sensing pins have no protective cover and the crocodile clamps included with the unit are quite small. The board and the USB cables are encased in shrink tubing for protection. The manufacturer therefore markets the BitScope Micro as waterproof, although the sensing connectors remain completely unprotected. A protective cap also would help prevent the risk of bent pins. The BitScope Micro works as a digital storage oscilloscope, so you need to configure it with appropriate control software. The device will then start taking measurements and transmitting the data collected in one fell swoop onto the computer. Once on the computer, the data is processed with software that displays the results, typically in the form of a graph. BitScope offers several GUI software programs free of charge  that let you perform various types of measurement and analysis. The software is available for download from the manufacturer's website; no registration is necessary, and you'll find 32- and 64-bit binaries for Windows, Linux, and Mac OS X. Linux and Mac have ARM-based distributions as well, which is why BitScope advertises that the Micro and the Raspberry Pi are compatible. During my tests, I used a fresh Raspbian installation as the basis for loading the software. The software most users will choose is BitScope DSO (Figure 4) for the oscilloscope function and BitScope Logic for serial protocol and logic signal timing analysis. BitScope Generator creates signals, and BitScope Meter measures currents and frequencies. BitScope Chart is a recording tool whose sole function is to capture signals for subsequent analysis. Additionally, with the BitScope Library AP, you can write your own programs for BitScope, and a server module makes the measurements available via the network. 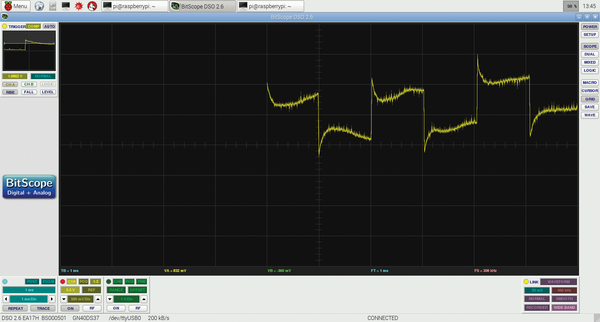 Figure 4: The BitScope DSO software package provides the functions of an oscilloscope. Here, it is displaying a PWM signal.